The Masterchef series in Australia has been a phenomenal success, we religously watched it every night at 7.30pm, cheering on our favourites and enjoying looking at all the great food. One of the things to come out of the show has been the increase in the kids interest in food and cooking. In the holidays they all had turns at picking something we could cook together ... not surprisingly they picked sweet things :) ... So here is the slice Mr 12 and I cooked. Since Miss 10 has become free of most nut allergies we were excited to cook with almond meal, it really made such wonderful difference to the slice..Enjoy! 1. Preheat oven to 160 c. Brush a 16cm x 26cm (base measurement) slice pan with melted butter. Line the base and 2 long sides with non-stick baking paper, allowing the sides to overhang. 2. Use an electric beater to beat the butter and sugar in a bowl until pale and creamy. Beat in the vanilla. Add the eggs, 1 at a time, beating well after each addition until combined. Stir in the choc bits, almond meal, combined flour and milk. 3. Spread the mixture over the base of the prepared pan. Bake for 30 minutes or until a skewer inserted into the centre comes out clean. Set aside in the pan to cool completely. 4. Meanwhile, place white chocolate in a heatproof bowl over a saucepan of simmering water ( make sure the bowl doesn’t touch the water ). Stir with a metal spoon until chocolate melts and is smooth. 5. 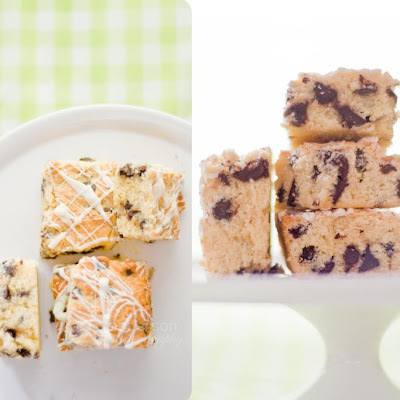 Use a fork to drizzle the melted white chocolate over the slice. Set aside to set. Cut into pieces.